"After leaving the corporate world 17 ﻿years ago, and pursuing art in various forms over the years, I settled on metal because I like the undisciplined nature of the art and being able to let my imagination flow. I am self taught, but my artistic ideas have been firmly implanted throughout my life by being fortunate enough to live in rugged environments that have motivated my artistic journey and influenced my style. I take real pleasure in using a cold static material such as steel to fashion a warm intricate design that compels the viewer to appreciate that the magic is not in the material of the piece but the hand that created it. Being an outdoor sports enthusiast and gardener, my appreciation of nature is abundant. I believe strongly in the practice of keeping our earth healthy and uncluttered so I use primarily recycled materials in my work. 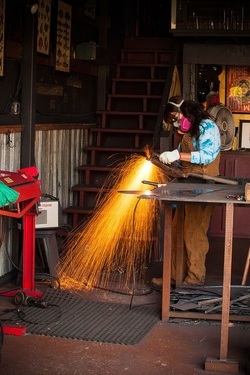 My favorite part of the process is going through scrap yards, sifting through piles of metal and finding that special treasure that I know will transform into a work of art." Kelly creates original, unique and one-of-a-kind intricate relic and patina plasma cut metal designs and heritage statement pieces for use as functional automotive art-panels, automotive art displays, interior design, custom speciality lighting, home, garden, business, and community art projects and more. Kelly also specializes in high end custom automotive functional, detailed art designs. Her art crosses over into virtually anything made of relic metals from vintage tools, farm and garden implements, vintage metal toys, rustic lighting and many other types of metal creations.